﻿ Hebrews 10:38 BUT MY RIGHTEOUS ONE SHALL LIVE BY FAITH; AND IF HE SHRINKS BACK, MY SOUL HAS NO PLEASURE IN HIM. But the righteous man will live from faith, and if he should withdraw, my soul is not pleased with him. But the just shall live by faith [My righteous servant shall live by his conviction respecting man's relationship to God and divine things, and holy fervor born of faith and conjoined with it]; and if he draws back and shrinks in fear, My soul has no delight or pleasure in him. 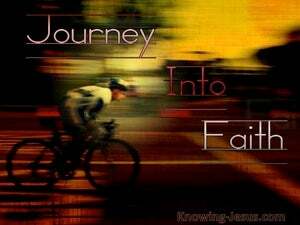 And my [i.e., God's] righteous person will [obtain] life by [his] faith [in God]. But if he turns back [from me], my soul is not pleased with him." But the just by faith shall live; and if he draw back, my soul will have no pleasure in him. But my righteous one shall live by faith, and if he shrinks back, my soul has no pleasure in him." the just shall have life by trusting in me, but if he revolt, he will be the object of my displeasure. 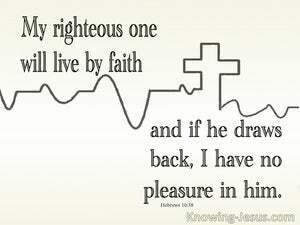 My righteous man shall live by faith: and if he may draw back, my soul has no pleasure in him. And he whom I accept as righteous will find life through his faith. But if a man draws back, my heart can take no pleasure in him." Now the just shall live by faith; but if he draw back, my soul hath no pleasure in him. And the just one shall live by faith; but if he draw down, my soul is not contented in him. But my righteous one will live by faith, and if he shrinks back, my soul is not well pleased with him." 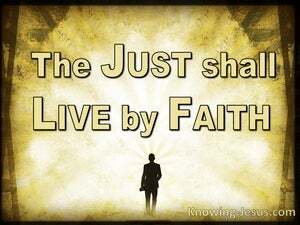 Now, "the Just shall live by faith. But if he draws back, My soul shall have no pleasure in him." 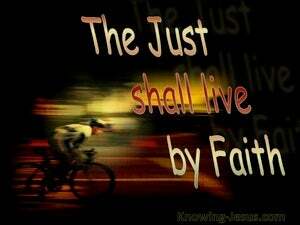 But the just shall live by faith. And if he withdraw himself, my soul shall have no pleasure in him. Meantime my just man shall live on by his faith; if he shrinks back, my soul takes no delight in him. But it is by faith that my Righteous One will live, And if he draws back, my soul takes no pleasure in him. 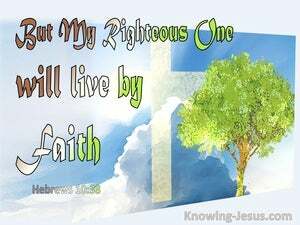 But my righteous one will live by faith. If he shrinks back, my soul has no pleasure in him." 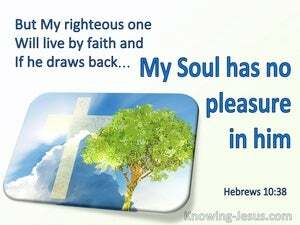 but my righteous one shall live by faith, and if he draws back my soul takes no pleasure in him. But, my righteous one, by faith, shall live, and, if he draw back, my soul delighteth not in him. "The just man then will live by faith;" and if he draw back, my soul shall have no delight in him. But it is by faith that My righteous servant shall live; and if he shrinks back, My soul takes no pleasure in him." Meantime, my righteous servant will live by faith. But if a man draws back, my soul has no delight in him." But the righteous will live by faith. If he shrinks back, my soul has no pleasure in him." "But My righteous one shall live by faith, and, if he draw back, My soul has no pleasure in him." and the just shall live by faith, but if any draw back, my soul shall have no pleasure in him. 37 FOR YET IN A VERY LITTLE WHILE, HE WHO IS COMING WILL COME, AND WILL NOT DELAY. 38 BUT MY RIGHTEOUS ONE SHALL LIVE BY FAITH; AND IF HE SHRINKS BACK, MY SOUL HAS NO PLEASURE IN HIM. 39 But we are not of those who shrink back to destruction, but of those who have faith to the preserving of the soul.